What are the legal rights in respect of children? Guardianship is the collection of rights and duties that a parent (or non-parent) may have in respect of a child. For example, a guardian has a duty to maintain and properly care for the child and has the right to make decisions in the major areas of the child’s life e.g. choice of religion, of school, adoption, consenting to medical treatment, passports and decisions about leaving the country and other matters affecting the welfare of the child. Access is contact between a child and his/her parent, relative or other person. This can mean having the right to spend time with a child or to communicate by letter, telephone etc. What are my legal rights in respect of my grandchild? 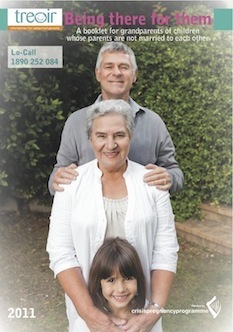 Grandparents do not have any automatic legal rights in respect of their grandchildren. What legal rights can I apply for in respect of my grandchild? whether or not an access order is necessary. any person with whom the child resides and has the day-to-day care of the child for a continuous period of more than 12 months and the child has no parent or guardian who is willing or able to exercise the rights and responsibilities of guardianship in respect of the child. The court shall not make an order for custody of a child without the consent of the child’s guardians. If the court is satisfied that it is in the best interest of the child the court can make an order dispensing with consent. Any decision made by the court will be made in the best interests of the child and the court will consider the views of the child where possible given his/her age and understanding. The court can also make an order for joint custody and specify where the child is to live. Where the child is not living with one of his/her parents, for any period, the court can specify what access arrangements, if any, are to be put in place. Grandparents can apply for guardianship if they have provided the day-to-day care of the child for a continuous period of 12 months or more and where there is no parent or guardian willing or able to exercise guardianship rights and responsibilities in respect of the child. The court will decide what guardianship rights a non-parent will get. These rights could include any of the guardianship rights granted to a parent. Parents/guardians and TUSLA, the Child and Family Agency will be notified of such an application. A qualifying guardian* may nominate a person (including a grandparent) to act as a guardian if the qualifying guardian is unable, through serious illness or injury, to exercise his/her guardianship rights. The nomination must be made in writing and can specify the rights and responsibilities that the nominated person can exercise. The nominated person must then apply to the court for guardianship rights when and if necessary. Each guardian, parent and TUSLA, the Child and Family Agency will be informed of such an application. The decision of the court will be made in the best interests of the child and may take the views of the child into account where possible given the child’s age and understanding. not being the parent of the child has custody of him or her to the exclusion of any living parent of the child. All parents who are guardians and other guardians who have the custody (day-to-day care) of a child should make a will appointing a guardian to act on their behalf in the event of their death before the child is 18. This is called Testamentary Guardianship. It is especially important where a parent/guardian is a sole guardian. It is possible for a grandparent to be appointed a testamentary guardian. The testamentary guardian will then act together with the surviving guardian/s (if any). If a parent dies without appointing a guardian in a will it is possible for someone with an interest in the child to apply to the court to be appointed a guardian of the child. NOTE: The appointment of additional guardians does not affect the guardianship rights of existing guardians. Guardianship rights for non-parents may be limited to making day-to-day decisions for the child. The court will make its decision in the best interests of the child and may have regard to the views of the child where possible given the child’s age and understanding. A court-appointed guardian continues to be a guardian of a child up until the child reaches 18 years of age. Think about how best to support your daughter/son in their decision-making without actually making decisions for them. You may want to contact one of the pregnancy counselling services listed on www.positiveoptions.ie for support and/or counselling. Think about what you are prepared to offer in terms of time, child-minding and indirect financial support (e.g. food, heat etc). Be realistic about how much time you can devote to caring for your grandchild and make this clear and agree it with your daughter/son. If you feel you are being taken for granted and left “holding the baby” for too long, remind your son/daughter that he/she is the parent and therefore the one with the main responsibility for the child. Keep an eye on your other children and do your best to give them the attention they need. Remember that both parents are important to children. Where there is no longer a relationship between them one of the parents, usually the father, can feel left out, isolated or unsure about his particular role and responsibilities to his child. Try to welcome, or at least tolerate, whatever relationship develops between the other parent, his/her family, and your grandchild. Time spent building a bridge of communication between families is truly in the best interest of your grandchild and all the families involved. Young parents, like other parents, want to be the best parents they can be and their families are very important sources of support for them in achieving this. The maternal grandparent in particular can be central in giving emotional and practical support to the young mother. The paternal grandparent can also play a key role in supporting her young son to take up the responsibility of fatherhood. Parents of young men who become fathers can feel disconnected from the pregnancy as the teenage girl and her family are the centre of attention. Fathers may feel the balance of power is very much on the mother’s side and that the mother and her parents have control over contact with the child. Get a copy of the Young Parent Survival Guide from Treoir Locall 1890 252 084. When parents are no longer able to care full-time for their children, grandparents may ‘step in’ to take on the role of main carer of their grandchildren in order to keep them within the family. See information on ‘Custody’ and ‘Guardianship’ above. It is important to recognise that your grandchild may need to maintain contact with her/his parents if this is in the child’s best interest. Get a copy of Treoir’s book ‘Family Links – Steps and Stages’ for hints on how to do this from info@treoir.ie or Locall 1890 252 084. If circumstances do not permit this contact, talking to your grandchild about her/his parents and keeping their memory ‘alive’ is very important. Check out what financial supports are available to you.